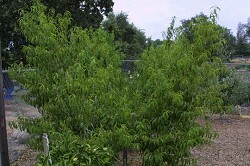 In this method, peach or nectarine trees are grown in a V shape that is perpendicular to the row. This allows closer spacing and ease of management. This system is similar to the open center in that the center is kept open through the growing season, but only two primary scaffold branches are developed, with no other main branches. All the fruiting branches grow directly off the two main scaffolds or off short branches arising from the scaffolds. Plant trees 5 or 6 feet apart in a row, preferably oriented north-south, and head them at knee height. Place two bamboo stakes in the grownd in a wide V shape and as shoots grow, tie one strong shoot to the stake in each direction. Remove or cut back all other upright branches that grow from the trunk, but leave lateral fruiting branches. Continue to direct the two branches upward and outward, and allow lateral shoots to grow off the two scaffold branches. Keep the center free of vigorous upright shoots. 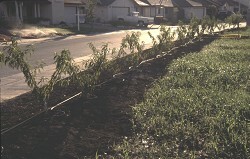 Peach and nectarine trees being trained to perpendicular V system in Davis. Row of perpendicular V trees at the Fair Oaks Horticulture Center.